Wolff found that the plants can "smell" or detect how much nutrition is available when she ran experiments in climate-regulated growth chambers in the Netherlands. But even astronauts will soon be able to abide by their mothers' exhortations to eat more veggies. "The dream of every astronaut is to be able to eat fresh food like strawberries, cherry tomatoes or anything that's really flavorful," Silje Wolff, a plant physiologist at the Centre for Interdisciplinary Research in Space (CIRiS) at the Norwegian University of Science and Technology (NTNU), said in a statement. "Someday that will certainly be possible. We envision a greenhouse with several varieties of vegetables." 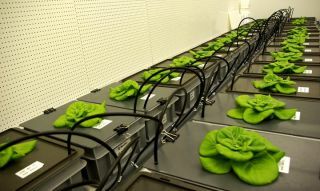 Wolff recently wrapped up an experiment where lettuce grew in space in specialized planters that regulate all the water, nutrients, gas and air the plants need. Though she used artificial soil derived from lava rock as a substrate, Wolff says the goal is for the plants to grow directly in water infused with life-sustaining nutrients. In space, she noted, all the water and food must be recovered, which means that plant fertilization needs to be "as precise as possible." Nutritional benefits aside, raising living crops inside a sterile, white-walled environment like a space station can provide physiological comfort, too. Astronauts often struggle with their appetites, leading to weight loss, Wolff said. "Addressing the psychological aspect of eating something fresh is one of our goals," she said. "Vacuum-packed food doesn't really remind you of food. Having something fresh that triggers the appetite and the right receptors in the brain is important." Gardening is also known to aid cognitive performance and mental well-being, both of which can flounder under the harrowing effects of extended isolation and confinement. NASA's Scott Kelly, who spent 342 consecutive days aboard the ISS in 2015, for instance, wrote about the psychological stress he endured in his memoir of the experience. "Astronauts like gardening and everything that reminds them of life on earth. They enjoy tending and watering the vegetables, and getting them to germinate," Wolff said. NTNU and CIRiS are currently collaborating with Italian and French researchers to suss out the viability of cultivating plant-based food for long space journeys. While typical ISS missions run up to six months, people traveling to Mars will need to live and work — and eat — in space for at least a year, researchers said in the statement. "The way space travel works today, it's almost impossible to take along all the resources you need," Wolff said. "That's why we have to develop a biological system so astronauts can produce their own food and recycle all of the resources." Now that its earthbound experiments have concluded, CIRiS will be placing beans in a centrifuge to sprout and grow on the ISS, where researchers can compare how different gravitational levels affect plants in space. On Earth, gravity causes warm air to rise and cold air to sink. On a space station, air is more stationary, giving astronauts something akin to a low-grade fever. Plants are similarly affected, Wolff said. "Stationary air affects a layer on the underside of the leaf where the stomatal pores are located," she said, referring to specialized cells that control gas exchange. "When gravity disappears, the boundary layer in the slit-shaped apertures thickens. This reduces evaporation and causes the leaf temperature to increase. Water vapor diffusion to the environment is an important part of plant regulation and can be compared with sweating to cool the body in humans and animals." CIRiS' work could have more terrestrial implications, particularly for cities with little land for cultivation. Food production can be optimized in the tightest of spaces by planting crops directly in water in indoor closed systems, where all aspects of climate, fertilization and irrigation are regulated, Wolff said. "The plants become less sensitive to nutritional deficiency because the roots are in direct contact with the nutrients," she said. " They're always able to access new nutrients through the water, and can use absolutely all the nutrients available — unlike with soil that binds the nutrients and affects their availability to the roots. And the roots don't rot when the water is mixed with a little oxygen."